Hello! Time sure flew by this weekend... I hope yours was a good one, and that everyone celebrating had a wonderful holiday! Ours was filled with lovely extremes: quiet and wild, slow and busy, full and peaceful. Most memorable were the special gifts that had nothing to do with what was wrapped under the tree: from grandma's many delicious meals to the bliss of having my husband home with us all day long from last Friday into the New Year! And let's not forget the two silly children, giddy with excitement, who kept us all entertained. During a momentary lull on the afternoon of Christmas day, I crept upstairs for a (rare) winter's nap. It wasn't long before my husband gently woke me up to say that I'd better throw on some boots and grab my camera. In the blink of an eye a magical mist had swept over the meadow and enveloped the woods. He knows me well... who needs sleep? 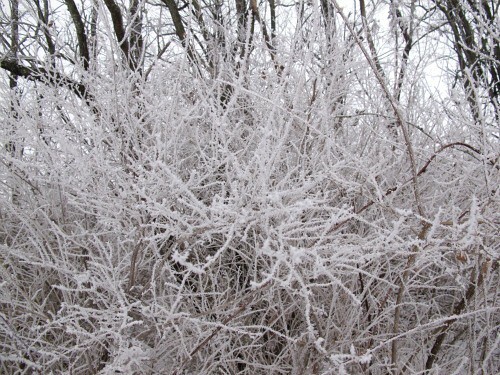 The mist had clung to each branch and then turned to ice. 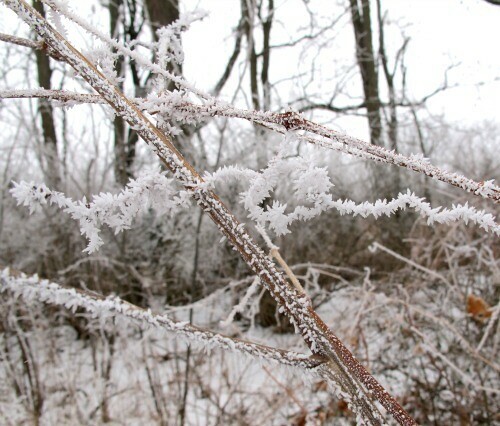 It cloaked everything in sight with frozen feathers, which reminded me of Margie's Canadian weather, of late. I didn't catch it at its peak, but it was still quite awesome, don't you think? 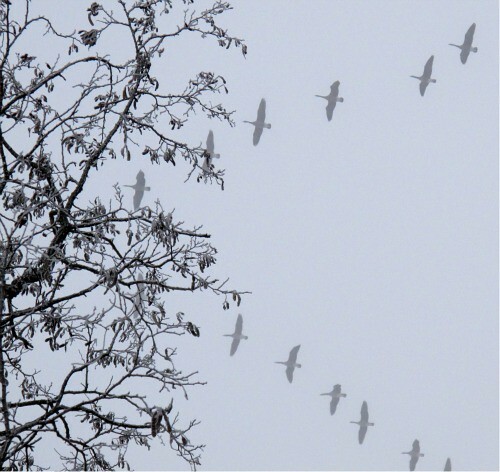 I did arrive in time for a tremendous thundering of flapping wings, as hundreds of Christmas geese burst through a shroud of gauzy clouds and honked what I took to be their holiday greeting. I quickly tried in vain to capture them on video for my family who was tucked in by the wood stove... and for all of you, too! I am most definitely a novice film maker. I don't blame you one bit if you giggle (or wince) as the camera goes wild when I stumbled from craning my head too far backwards. Needless to say, this may give you a taste of the flying frenzy I witnessed, just multiply it by about 20! You can also peek in at several photos from the weekend right here on my flickr stream. We're enjoying this sweet and slow last week of the year... you, too? Great photos. 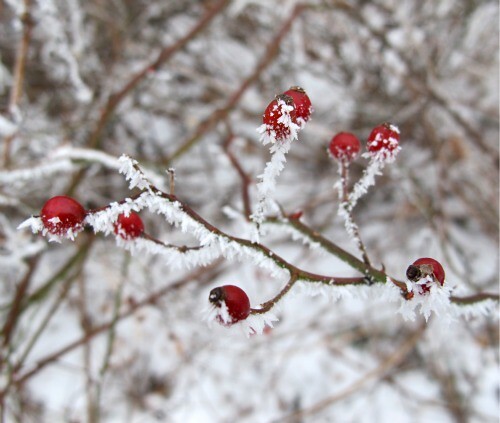 I especially love the berries with the frost and bare branches. I especially like the photo with the geese--very lovely! Happy Holidays and a big thank you for this wonderful blog. Wow, what amazing photo's!! So gorgeous, and something that I have never seen. It sounds like the perfect Christmas. I love the video of the geese. I'm glad you shared it. wow!!! takes my breath away! What lovely photos and the geese are wonderful. Geese are wonderful and it must have been so magical to see and hear them early in the morning. Thank you for sharing. I loved the flying and honking geese. They make their way down to south Louisiana for a visit to wherever it is they go. I hate to tell you, but way down in the south they crawl up on them and some end up in a pot of gumbo. I have never eaten any since I live in the northern part of the state, but have heard tell that it is some kind of good. Your pictures are soooooo gorgeous. 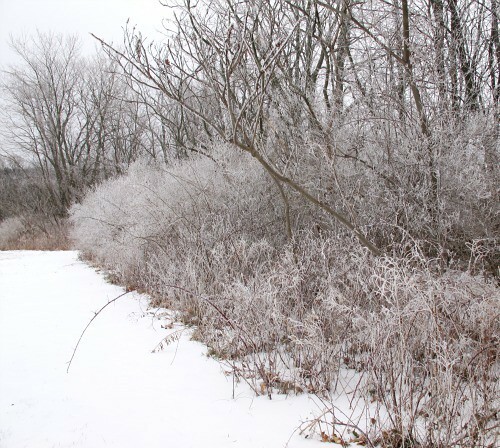 We are fortunate so far this winter and haven't had any snow or ice and I am praying it stays like that as we aren't equipped for that kind of weather. When we do have ice storms, we lost power for up to a week and sometimes longer and boy does it get cold in a house that has central heating. Have a Happy New Year. love the picture with the berries! Thank you for your inspiration...the geese are flying here too, just in a different space...magical aren't they.